Francis receives Lebanese President Michel Aoun, for whom "The coexistence of Lebanon occupies a special place in the heart of Pope Francis, who will respond to the invitation to visit the Land of the Cedars." Vatican appreciation for Lebanon's support to Syrian refugees. Beirut (AsiaNews) - Pope Francis told the Lebanese President Michel Aoun he intends to visit the Land of the Cedars, which he always remembers in his prayers. This is what the president tweeted at the end of the visit today at the Vatican. The visit to Pope Francis was the first of the Lebanese President in Europe. On this occasion, the Pope said: "I will visit Lebanon and will always pray for the country." "The coexistence of Lebanon – wrote the president - holds a special place in the heart of Pope Francis, who will respond to the invitation to visit the Land of the Cedars." According to a statement released by the Holy See Press Office, During the cordial discussions, the Parties focused on the good bilateral relations between the Holy See and Lebanon, underlining the historic and institutional role of the Church in the life of the country. Satisfaction was then expressed for the efforts on the part of all the various political parties in putting an end to the presidential vacancy, emphasising the hope for an increasingly fruitful future collaboration between the members of diverse ethnic and religious communities in favour of the common good and the development of the nation. The discussion then turned to Syria, with special attention to international efforts to find a political solution to the conflict. Furthermore, appreciation was expressed at the welcome that Lebanon has extended to many Syrian refugees. Finally, there was a broader exchange of views on the regional context, referring also to other ongoing conflicts and the situation of Christians in the Middle East”. Aoun also he met with Cardinal Secretary of State Pietro Parolin. The president was accompanied by the head of the Lebanese diplomacy, Gebran Bassil, the charge d'affaires to the Holy See, Albert Samaha, the presidential adviser for information, Jean Aziz, and the Head of the information Chair, Rafic Chelala. 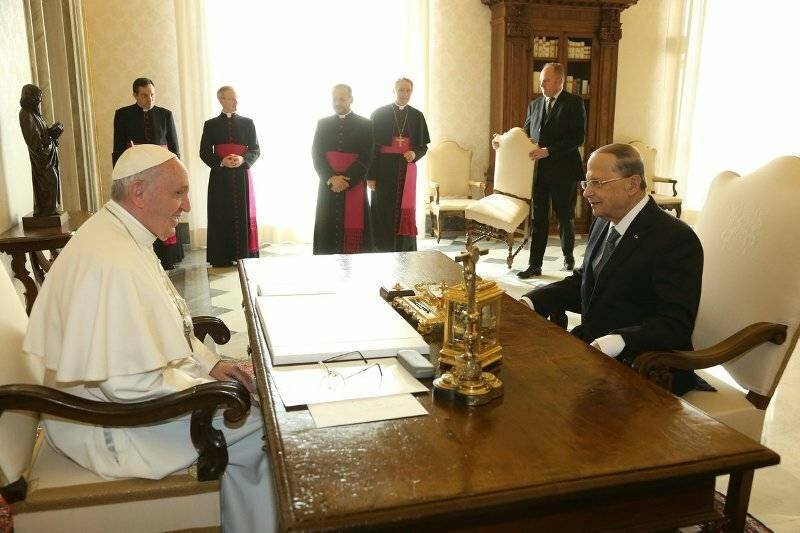 President Aoun who arrived in Rome yesterday, stressed the importance of his meeting with the Pope, in the light of the "solidity of the relations linking Lebanon, in all its components to the Church and the papacy." "The Eastern Christians - he added - today live difficult circumstances, in a region that is the cradle of Christianity and Islam, we see in this visit a glimmer of hope that confirms that Lebanon will always remain as the strongest hope for the future of the East and the world. "